For Hein Vanhaezebrouck, unfit Henry Onyekuru might not feature for Anderlecht again this season, contrary to unsubstantiated reports in the local press that the striker is in tip-top condition. 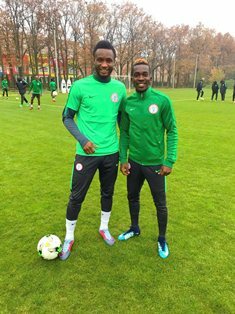 It was also wrongly reported that the Nigeria international was included in the match day squad for the Belgian champions last weekend despite Anderlecht axing him from the 18, and the fact that he had to watch the game against Club Brugge from the stands. The Anderlecht manager is optimistic that Henry will be fit for the World Cup and it's up to Gernot Rohr to name him in the Super Eagles 23-man squad list. On the fitness status of Henry and Senegal defender Kara Mbodji, Vanhaezebrouck was quoted as saying by Het Nieuwsblad : ''We evaluate their situation daily, but those injuries were pretty serious and so the recovery requires some time. "Kara is making good progress, but we are not going to take any risks with the World Cup in mind. Henry has made only one appearance for the Super Eagles, against Togo in an international friendly last June in which he lasted 32 minutes on the Stade des Diablots turf.